Is stealthy healthy a thing?? Because if it’s not, it should be. Being a sneaky mom involved me basically sneaking vegetables and other healthy ingredients into foods he liked. And disguising the vegetables in such a way that he would never know he was eating them. I got him to eat Chocolate Zucchini Cake (sold as chocolate cake, of course), and I got him to eat brownies made with black beans (yay, fibre!). Like most kids, he likes Mac and Cheese. Now, I do keep a box of the stuff on hand for emergencies, but for the most part, I am snobby about my mac and cheese. I make it from scratch. It’s not even that much more complicated than the stuff from the box. Because I make it from scratch, I can sneak all kinds of healthy stuff in there that he has no idea about. This recipe is one I’ve been making for a while. There’s three things that make this recipe sneakily healthy: first off, the cheese sauce is fortified with a dose of vegetables (in this case cauliflower, but I’ve also used yam or squash), the pasta is packed with fibre (sneakily), and the crunchy breadcrumb topping is also high in fibre. I’ve been using Catelli Smart Pasta for years. I love it. It looks and tastes like white pasta, but it has way more fibre in it. 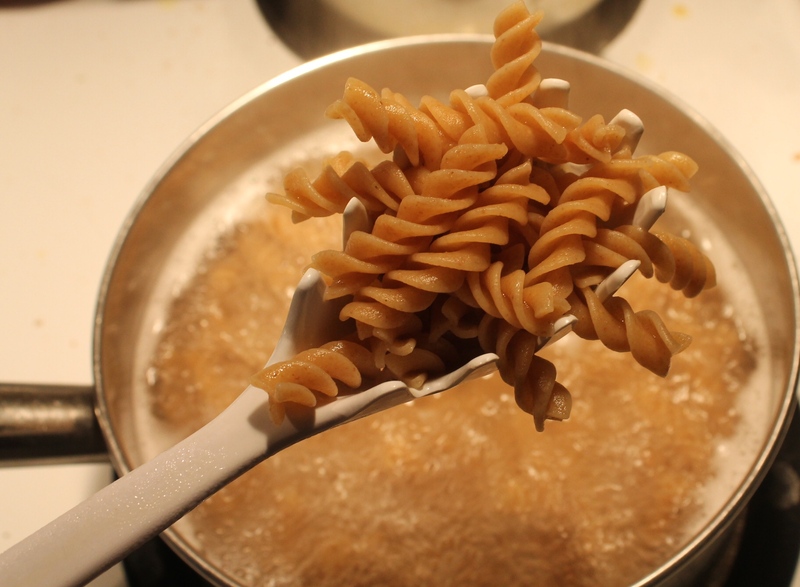 I know, you could just buy whole wheat pasta, and that would also be high in fibre, but I find it harder to cook with, and I find the kids sometimes reject it, because the texture is not as soft as regular pasta. Catelli Smart has 8 grams of fibre per serving, which is 32% of your recommended daily allowance of fibre right there! Catelli just launched a new line, called Healthy Harvest Ancient Grains. In addition to being high in fibre, it has other health benefits as well, as it incorporates flax, which is a source of Omega-3s, and quinoa, which has protein. High fibre and hidden veggies are what make this mac and cheese sneaky. Your kids (or your vegetable hating boyfriend–wait, is that just me?) will never know. Cook the pasta in a large pot of salted, boiling water for about 6-7 minutes. The pasta can be al dente, as it is going to bake in the oven, and soften some more. Drain in a colander, and allow to sit while you make the sauce. In a medium saucepan, over medium heat, melt the butter. Add the flour and stir well, to make a roux. Add salt and pepper, and the nutmeg. You can also add a dash of garlic powder, as well. Add the cauliflower puree, and then the milk, stirring well, allowing the sauce to come back up to the boil and thicken. Once the sauce has thickened, add the cheese. Taste and adjust the seasoning, or if the sauce is too thick, add a little milk to thin it down. In a large bowl, toss together the sauce and the pasta until well coated. Turn out into a casserole dish. For the topping, melt the butter in the microwave, and mix into the breadcrumbs in a small bowl. Sprinkle over the top of the mac ‘n’ cheese. Finish with an additional grating of cheese over the top. At this point, you could freeze the mac ‘n’ cheese for another day, if you like. Bake in a 350 degree oven for about half an hour, or until everything is hot and bubbly.